A temporary passerby in this world we have. A fellow sojourner just like you. All I can say after watching this presentation is: “HEAR, HEAR!” It’s not only the USA that suffers from this type of corruption. Other countries too, which seek to emulate the democracy of the world’s reigning superpower, most probably also suffer the same type of problem. Lo and behold, the corrupted political economy existing in many republics today. Hello to all the politician-puppets of the super elite club. Whenever I travel to another country, I always take photographs. My digital camera’s with me, and I try to snap at any interesting sight that my eyes lay upon. Weirdly enough though, I’ve lost that eagerness to snap photos in Hong Kong. It’s Day 3 here, and my memory card’s still barely filled with any worthwhile photo to remember. All I have so far are images of streets crowded by shops, people, and well, by more shops again. If you’ve been here, you’d realize how consumerism is at its all-time high. Areas like Tsim Sha Tsui and Mongkok, for instance, seem to endlessly thrive upon a cycle of constant selling and buying of various goods and services. 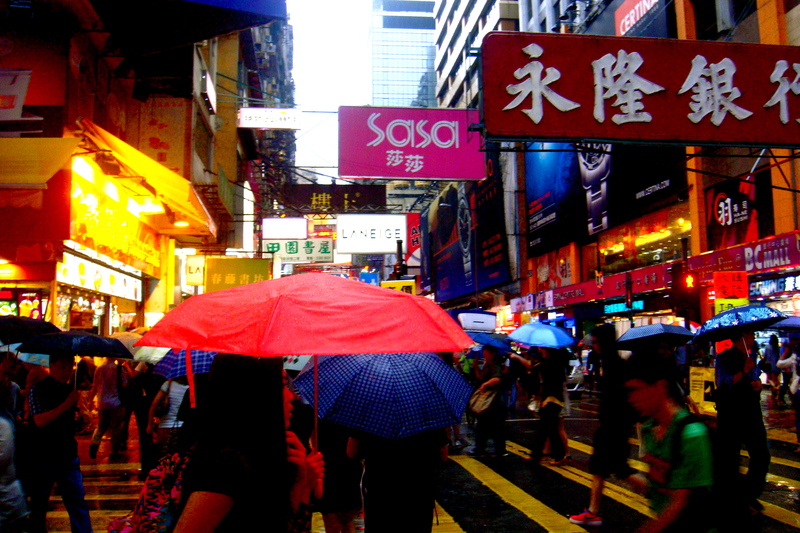 HK, with its small territory, manages to cramp up thousands of shops along streets and shopping malls. Billboards abound in every corner, creating and heightening the need for material goods. High-end brands populate nearly every street and the drive to spend, spend, spend, is always there. There are other famous recreational areas of course, but most I believe, are artificial–such as HK Disneyland or the Ocean Park. Of course, this is not to say that HK doesn’t have its own culture and heritage. Hong Kong’s cultural facets, which are encapsulated by a greater China, are not undermined. It just so happens that from a tourist’s perspective–specifically, from my perspective–it seems as if consumerism outshines all the other facets in this city more, just like how a bright pink and white Sasa billboard catches one’s eye amidst all the other competing sights. Take note though that this is not my first time to visit HK. I’ve been here a couple of times before, usually as a tourist. I’ve been here as an exchange student too, but only for a quick period. I guess those prior experiences seem to have made me “complacent” about my current stay here. I’m not really that excited to roam around here. I love to keep on walking–entering different streets and bustling through the MTRs–but my zeal to explore around seemed to have depreciated. Maybe, if I get to visit HK again with a friend or more, my level of eagerness would change. However, that’s just because the thought of touring with a group of friends to a different place (well, to any foreign place actually) is always exciting. I suppose I’ll bring up this travel proposal to a friend or so, once I get back. Now, I’m just wondering how my experience would be if I just pursued that trip, sponsored by ADB, to India. If not for the timing of events and other prior commitments, I would have grabbed that trip instead. I would have attended the Asian Youth Forum as well as the ADB Meeting, reported on the events while making a sideline tour of New Delhi instead. I’ve seen photos from some of my debater friends who are currently there and it seems like they’re having a grand time. Oh, well. There’s always another next time (I hope!). Signing out again to plunge myself in this crowded arena.